Takami is arguably the cutest of the Kagura girls and is very shy about meeting new clients. 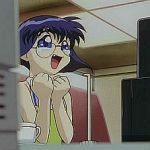 Takami is the computer hacker for Kagura and when she's out in the field, she takes out her butterfly knives and grenades to keep the phantom cats at bay. Takami is commonly seen wearing rollerblades when in the field. A serious character flaw of Takami is her inability to cope with stressful situations. When surprised or under mild to moderate duress, she freezes up and begins to babble incoherently. She used to be an otaku before joining Kagura according to the manga.